“Aris, Aris,” Hicham called as he used his arm to pull himself across the floor towards me to watch his wheelchair being assembled and beamed me a smile that melted me. I was there with my colleague Redouan, to help fit Hicham with his first ever wheelchair, donated by a fantastic Australian charity called Red Goes Faster. 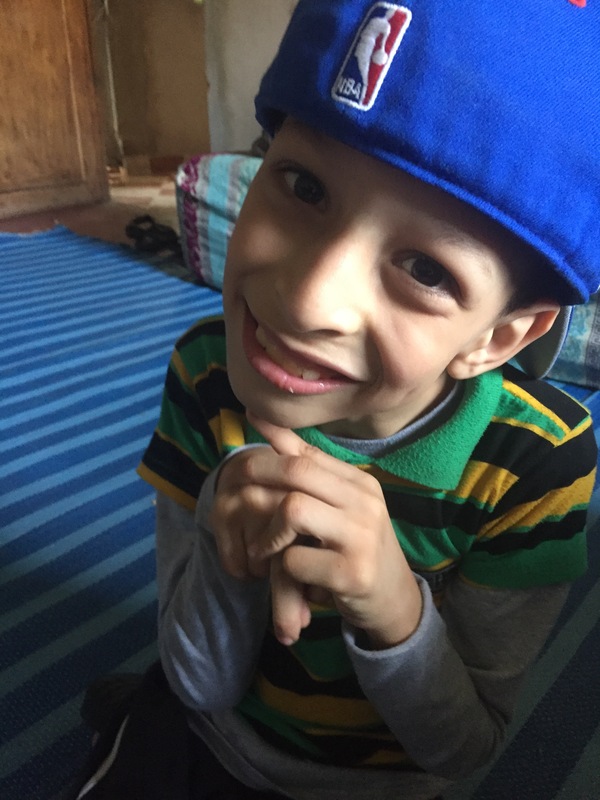 Hicham is 8 years old and has cerebral palsy. He lives in Tamatert, a hamlet in the High Atlas mountains, which is a group of houses, a mosque and a guesthouse, all clinging precariously to a red cliff of hillside. His family have some chickens and a cow and a bit of land which they farm for vegetables, as everyone else does in the village. There are orchards of apple, walnut, peach and almond trees and in the spring the valley is covered in white and pink blossom, punctuated by vivid blue iris. In many ways it is a paradise, but for this little boy, his traditional home with its steep steps, and the rocky inclines all around also make it a prison. His family is close and loving and he is beautifully cared for but they want to give him more of a chance in life and that is where Red Goes Faster came in. The charity, which was set up by Michelle Hank and Brahim Tigharmin, works very simply. Volunteers in Australia with Wheelchairs for Kids make the chairs, Red Goes Faster raises the money to ship them, and then volunteers in Morocco find the children and go out to them to fit the chairs, which are fully adjustable. If the child can use a wheelchair, then he or she gets a wheelchair. 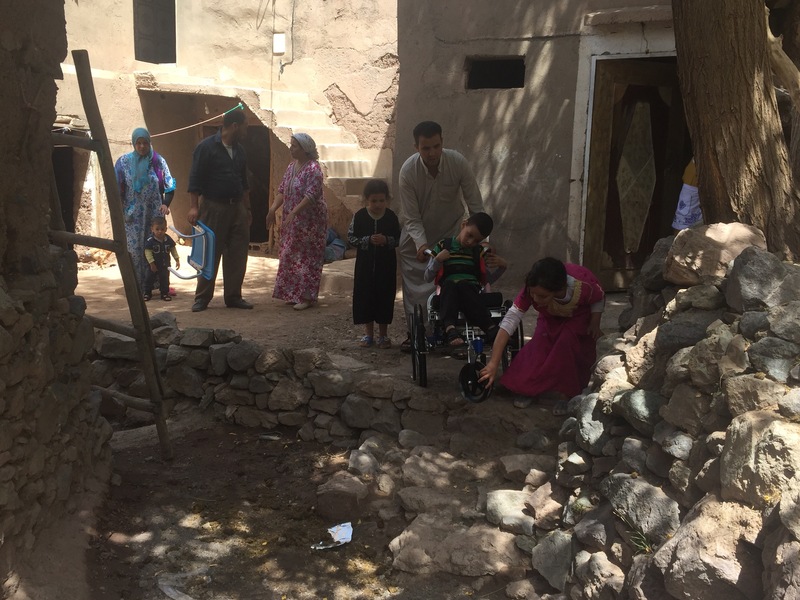 We were so lucky – there was one wheelchair left from the first consignment that had come over, so I was able to pick it up in Marrakech, collect Redouan who was going to build it, and drive up to Tamatert the next day. The whole family was waiting for us when we got there. We were ushered in to the big reception room and got started. 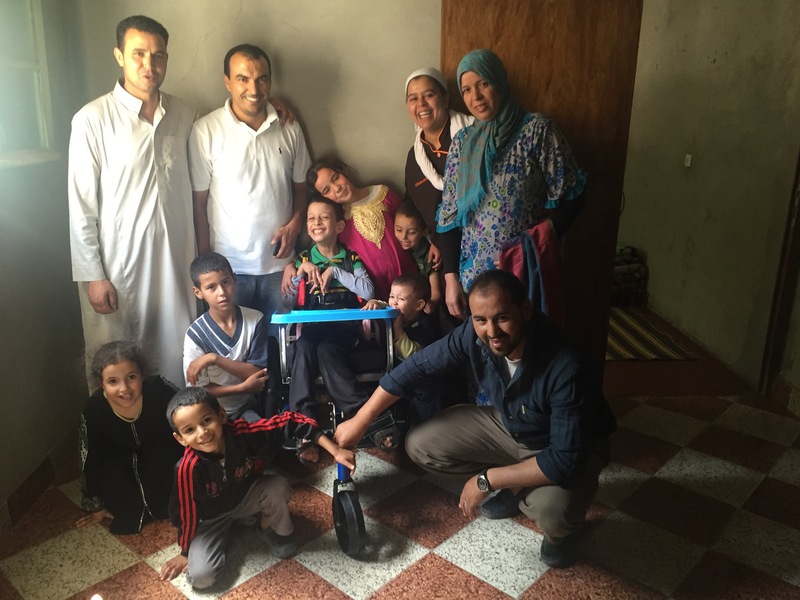 My job was to measure Hicham so that Redouan could fit the wheelchair to him, talk to the family – in a mixture of Berber (Tashlaheet) and Arabic- to find out more about Hicham and what they wanted to use the chair for. Hicham himself was full of energy and excitement and clearly intelligent. He took a strong interest in what we were doing and followed all the steps. He learnt my and Redouan’s names and we managed to talk a little. Most of the children fitted for the wheelchairs have cerebral palsy, many of them very severely, to the point where they can’t support their heads and they are spasming a lot. Hicham, though, had excellent muscle tone in his neck and torso. He could actually move across the floor on his knees, using his arms to push himself to the extent that I hope he may actually be able to wheel the chair himself on a decent surface. He also didn’t need nappies and could go to the bathroom with some help. This was a huge plus. He understood everything we said although he had a bit of a problem forming his words and his Mum said that he could look at photos on the phone by using his forehead to swipe. Redouan had been working away, and the chair was ready. Everyone gathered around and Hicham was lifted in. Pure. Unadulterated. Joy. His proud Mum and Dad, his giggling sisters, his neighbours and me and Redouan, we were united in total happiness as Hicham sat in his spanking new 4×4 off road wheelchair, ready to roll. He laughed and laughed. We all spilled out of the house, manoeuvred the chair down the stairs and into the yard, scattering the chickens. The chairs are designed for rough terrain with big knobbly wheels and one wheel in front and two at the side for stability. Hicham’s parents took him for a turn round the village. It will still be hard work for them because the terrain is difficult but at least they can bring him out to be with the other kids and get around a little bit. There is a tarmac road about 100 metres up that leads down to the town of Imlil that is entirely navigable. I hope that Hicham gets to go to school and I hope that he gets to wheel his own chair on a road or a pavement. I know that his parents are committed to making his life better and will try everything that they can to get the full use of it. Regardless, though, this wheelchair will give his parents a break from having to carry him everywhere, and will allow him to sit outside on his own. It will give him at the very least that independence and freedom and to someone who has never had any, that is really something. UPDATE: The fantastic news is that Hicham’s Mum DID move to Marrakech and now he is going to school. This is such a happy thing for the wonderful, clever boy and his caring family. It proves that charity works and changes people lives. Thank you so much to all those people so far away in Australia who made this happen. Alice! this us the little bit in Tamatert you told me about!! What a fabulous and moving story! Thanks for sharing. ALICE!! this is the little boy you told me about in Tamatert. What a fabulous and moving story… Thank you for sharing.